1. Take mango puree and papaya puree in a wide pan and cook for three to four minutes. 2. Add sugar and cook till sugar dissolves. 3. Add half the lemon juice and cook till the mixture thickens. 4. 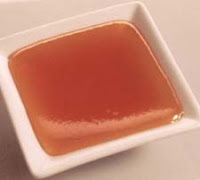 Take a spoonful of the boiling jam on a plate and allow it to cool. If it sets on cooling and there is no water separation, the jam is ready to be bottled. 5. If there is any water separation, continue to cook till the jam is ready. 6. Pour the jam while still hot into sterilized bottles. 7. Let it cool completely and then seal with tight fitting lids and store. While checking the doneness of the jam, if the sugar starts to re-crystallize, reheat the jam and increase the amount of lemon juice. The lemon juice inverts the sugar, thus preventing it from re crystallization.